HAMP loans were bundled into mortgage-backed security pools purchased by the federal reserve with printed money, making foreclosure politically impossible. Borrowers were granted loan modifications either through HAMP or through a private program. Most borrowers don’t realize the loan modification program matters a great deal. HAMP loan modifications will become a permanent entitlement; private loan modifications will become a future foreclosure. Private loan modifications are tomorrow’s distressed property sales. When a borrower can’t afford their payments, they may be eligible for a HAMP modification. As Mike noted last year defaulting on your home now includes automatic enrollment into a loan modification program because the Obama administration broadened the parameters so much that nearly everyone qualified. There is a catch, and it’s a big one: not all servicers participate in HAMP, and if the borrower’s servicer didn’t participate, they were likely stuck with a private loan modification, or none at all. Once a borrower got into the program, their loan was packaged into a mortgage-backed security pool and made available to investors, but the federal reserve was the only investor willing to purchase these obviously terrible loans that redefault at rates north of 30%, so the federal reserve holds most of this toxic paper. The strategy is widely known as a “good bank, bad bank” strategy, and it worked. The federal reserve absorbs these losses better than any other investor for one simple reason: they print the money to buy the bad loans. If these loans go bad, and most of them will, nobody cares because nobody is harmed by the destruction of printed money on the federal reserve’s balance sheet. Given this reality, it’s very unlikely many of these loans will be foreclosed on. Can you imagine the political fallout when everyone realizes the federal reserve was the foreclosing entity trying to get back printed money? Since almost none of these loans will be foreclosed on, anyone in the HAMP program can apply for a loan modification, and they will get one. People will quickly learn to game the system and look poorer than they really are to maximize their newfound housing subsidy. For as appalling as I find that, it’s hard to get too upset because it really is being paid for by free money. This is no taxpayer subsidy; it’s just a lucky break for those foolish and irresponsible enough to obtain it. When the borrower’s servicer doesn’t participate in HAMP, the borrower faces very different circumstances. First, their loan modification isn’t subject to any pre-defined terms, so some loan modifications are more borrower-friendly than others, and many are not friendly at all. Unlike HAMP loans, most of private loan modifications don’t amortize, so the borrower isn’t reducing their loan balance while making their modified payments. Unless house prices rise, borrowers aren’t getting any closer to an equity stake. Since private loan modification terms aren’t as favorable, and since they don’t amortize, the path to equity is much more difficult, and most borrowers probably won’t make it. The loan modification entitlement will be rescinded as prices near the peak. Lenders will be less generous in granting modifications regardless of a borrower’s circumstances. Lenders will want their money back to loan to a more qualified borrower who will pay in accordance with the original note terms. Contrast that to the HAMP modification owned by the federal reserve that printed the money, and the difference between how these borrowers will be treated is obvious. The example in this case is a real world case of a modification granted by Wells Fargo Bank, N.A on behalf of investor HSBC Bank USA, National Association as Trustee for Wells Fargo Asset Securities Corporation, Mortgage Pass-Through Certificates Series 2006-AR12. The borrower was asked to sign this modification back on February 26, 2010 on a loan amount of $721,478.83 with a capitalized past due amount of $7,879.33. The existing rate was dropped from 6.5% to 4.375% for a term of 12 months. The payment dropped from $3,865.33 to $2,601.66 during this period of time due to the interest rate reduction. This was a private loan modification where the lender kicked the can for only one year on a very large loan, probably in California. The borrower is not sure if she was approved for HAMP or not at the time and at this point has given up hope at correcting this bad loan modification. The servicer and the investor believed they would make more money keeping the loan rather than turning it over to HAMP, so like B of A, they steered the borrower toward a loan modification that served their interests over the borrowers. She made her payments on time for a year at $2,601.66 and when she went to re-apply for help because of the scheduled payment increase, she was told that she could not get another modification as the investor only allowed one modification through the life of the loan. Most likely the value of the underlying collateral rose to the point the lender could recover most, if not all, of their outstanding loan amount, so they weren’t motivated to bargain. The HAMP servicers will continue providing modifications until they become a permanent housing subsidy; the private servicer will not. The payment for the borrower jumped 48.57% from the payment she was making on time and this caused her to miss her payments again. She was told when she accepted her modification that after a year, she could re-apply if she could not afford the payment adjustment since the payment shock was going to be so high as to put her debt to income ratio above 51% of the income the servicer had verified. People who sign documents they obviously do not understand are foolish, and they deserve whatever misfortune comes to them. Claiming ignorance to the terms of financial agreements can’t become a viable excuse, despite the left-wing politicos insistence on making it a reason people can back out of any contract. Why would Wells Fargo Bank, N.A allow this to occur and not at least seek out the investor and ask for a long term solution that would allow the borrower to retain their home?One possible reason could be that it would not make financial sense since now, the home prices have gone up enough to warrant liquidation of the property. As I stated, the loan modification entitlement will be rescinded as prices near the peak. These kind bad loan modifications cause people to give up hope and walk away from their home or list it for sale. That loan modification accomplishes everything the lender intended: the borrower made payments rather than remaining delinquent while prices rose high enough for a sale to make the lender whole. Remember, no lender cares whether or not the borrower stays in their home; the lender is only interested in recovering their capital. The nation’s four largest banks have exceeded their required share of financial relief to struggling homeowners under a landmark settlement reached two years ago, a compliance monitor for the deal said Tuesday. Lenders have one less reason to grant loan modifications. The vast majority of the relief Mr. Smith announced was provided through principal forgiveness on first-lien mortgages, which accounted for 37%, or $7.6 billion, of the credit amount. The second-largest bucket, which includes short sales, or transactions in which lenders allow borrowers sell their homes for less than they owe, accounted for 31%, or $6.4 billion of the credited amount. These lenders forgave some principal on deeply underwater loanowners leaving them somewhat less underwater. Lenders believe this gives borrowers hope they will have equity again in their lifetimes, prompting the borrower to make payments while they wait many more years to get above water. This was not a magnanamous move by lenders, but a loss minimization procedure they were going to institute anyway. It’s a travesty that lenders were allowed to write off short sale losses. This is money the lender was certain to lose anyway, but the settlement allowed them to count it as borrower relief. During the housing bubble, housing bears wrote often about the ticking time bombs of teaser-rate mortgages and adjustable-rate mortgage resets. The bears were right as most of these blew up and became the shadow inventory which ultimately became the loan modification inventory we have today. Many of these bad loans became bad loan modifications, and they haven’t been completely removed from the system or permanently resolved. Is the Mortgage mess resolved or foreclosures merely delayed? The answer is delayed, in the form of private loan modifications. Here is a classic debate of inflation vs deflation. Notice the comments below the video? Almost all of them are pro inflation. The more QE they do, the less impact it has on the economy. What inflationists overlook is all the QE is offsetting debt destruction. Eventually, the debt destruction stops, then continued QE is very inflationary, but as long as we have bad debt polluting the system and being written off at the banks, QE is merely an offset to money that was “printed” when the bad loan was made many years ago. If you are an “inflationists”, you are on the same side of the debate as the Fed. The Fed has added trillions on their balance sheet, and it has not benefited the (zombie) economy. The Fed has NOT got what they wanted, otherwise they would have stopped at QE1 or QE2. They even announced QE3 (infinity) without limits … and that has failed … they’ve officially reached the limit. Even the morons on the FOMC is starting to get it … The more QE they do, the less impact it has. Incomes are still in the quagmire. There is no inflation … just more asset bubbles. I think the debate is over … The Fed lost. Hey … back in 2008 was Crude inflation when it was $140? It dropped below $40 before the year was over. Go look at that chart. It’s ugly. All these things go up (spike), and down (crash) together … crude, food, stocks, bonds, etc, etc, etc … oh, and Gold too. They’re all manipulated tools of Wall Street. The Vampire Squid has financialized our entire economy. Are those charts adjusted for weather and leveraged buying at the mercantile exchanges? So, the currency created by the Fed is negated by debt destruction? What do you mean by debt destruction? When a loan is not repaid and the lender cannot recover from the collateral, money is destroyed. Nobody gains when a loan is not repaid. This is not a zero-sum game. The destruction of money is deflation, whereas the printing of money is inflation. For the last several years, these two forces have counterbalanced one another. >>>For the last several years, these two forces have counterbalanced one another. That’s right IR, and what people like me are saying is the money printing is now much less potent than it was when this Ponzi Scheme (QE) started. The Fed is indicating that they are going to at least try to stop the QE, and I think that’s the key to them acknowledging they can’t do much more and remain credible in the world markets. 1) Incomes rising, making it much easier to pay outstanding debt. AKA, Inflation. 2) Debt Destruction, making creditors eat losses on assets. AKA, DEFLATION. I think it’s very clear that the inflationists have lost this argument. There is no inflation. People can’t pay more without higher incomes. There can be no sustainable inflation without incomes rising … PERIOD. Why are you assuming that the debt will be reduced? How many times since the creation of the Federal Reserve has public or private debt been reduced? You see the debt as a problem, yes? What makes you so sure that the Federal Reserve and the member banks see debt as a problem? I think, well actually I know, that the purpose of the Federal Reserve and the member banks is to increase debt/money supply. That is how they make money, or actually how they transfer wealth to themselves. Increases in the money supply/debt have never lessened burdensome debt, so what makes you think that is their intention? What exactly has the Fed failed at? Stimulating the economy? Economic prosperity for Main Street? >>>How many times since the creation of the Federal Reserve has public or private debt been reduced? It says nothing about the number of times which private and public debt have been reduced. That graph expresses debt as a percentage of GDP which includes CPI as a negative factor in GDP. As you are well aware, debt expansion is the same as money creation in our monetary system so putting up a chart of debt as a percentage of a CPI factored number is either misleading (an intentional lie), ridiculous, or just plain dumb. 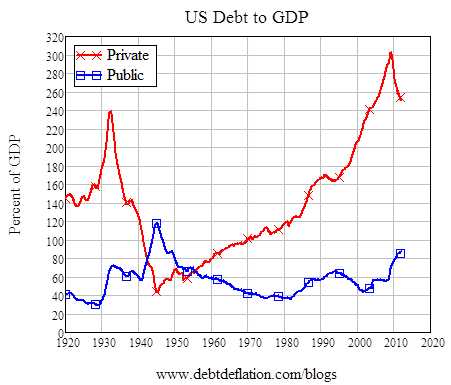 The number of times the public debt has decreased since the advent of the Fed is once, and that was right after WWII. Private debt, I don’t remember the exact number, but I remember enough to know it decreased seldomly, especially relative to the time it has spent increasing. And I think you are missing the point. If debt has been increasing, (Do you think it has not? ), almost on a non-stop basis since the creation of the Federal Reserve, why in the world would anybody think that the Fed has any interest in reducing debt? You said the Fed will write down debt. When has the Fed EVER written down debt? What would the consequences be to confidence in the dollar if the Fed and/or the federal government wrote down debt? If the dollar is “backed by the full faith and confidence in the United States Federal Government”, and the dollar is what gives politicians and bankers their power, what are the odds that the Fed will write down debt? There are countries which have written down debt, in other words they just told their creditors to go pound sand. You may want to look them up to see what happened? Unless of course, they will write down debt, PERIOD! And inflation can’t happen without concurrent increases in income, PERIOD! In which case reasoned logic takes a back seat to proclamation. What I have never understood is why calculating the value of debt destruction (write offs) appears to be such an inexact science. In concept, shouldn’t that value be known (by the banks anyway) to the penny? I think these reserves that are being held by the Fed on behalf of the banks, are going to be used to soften the blow when the next economic crises comes. Could be. Tough one to predict. One other metric not often quoted is the so called “velocity of money”.. My understanding is that if this value is low, then money-creation vs. debt-destruction equation essentially balances out to zero. However, if the velocity value goes high then hyper-inflation will become a huge issue. You are assuming incomes must inflate with consumer goods. Why? People and corporations borrow, (money/debt creation), and spend with no concurrent rise in wages. Why? Sustainable or not, the money supply has increased and it has to go somewhere. The government convinces regular folk that there is no inflation because their incomes have not risen. My wages have not increased, but denying that there are trillions in reserves at the Federal Reserve does not mean that debt/money creation does not have an effect. It just isn’t the effect that folks are accustomed to. They are letting the government and the MSM do their thinking for them. When has the government ever forced write downs of treasury debt? And why not? What would happen to the dollar if the government ever did force write downs? What would happen to the president’s power and Congresses power if treasury debt was “written down”? If you are waiting for the government or the Federal Reserve to do what they SHOULD do, you may be in for a long wait. What should happen has absolutely nothing to do with what is likely to happen; in fact, quite the opposite. It is an asset. So? Why do you think that asset price increases are not a direct result of monetary inflation? Why is it’s status of being in a bubble not a result of inflation? I don’t know if it is in a bubble or not, but from a personal finance perspective, I find it is not smart to deny reality. That was a typo on my part. It was 2011. I don’t need to speculate on what things would be if reality was different. I speculate based on what is, rather than on what should be. Mortgage rates are what they are, until they change. Seriously? Piss me off! Please! Do you think IR ever holds back based on how I might feel? I think he knows I am laughing most of the time. I am about as far from being a gold bug as anybody you will know. The only asset I have emotional connection to is So Cal real estate, but denying gold’s place in the current economy would be silly, and the wait and see thing is working out quite well. Whether or not gold is down all depends upon your perspective. If you bought at 1900, then yeah, it is down. If you bought at 450, and sold a chunk at 1850, your perspective may be different. I am not quite sure what “sustainable” means in this context. Specific assets inflate and deflate based on numerous factors. As far as I can tell the money supply is still increasing and I don’t think the Fed can reverse course now. Financially speaking, I don’t BELIEVE anything. For me it is all probabilities and odds. And mostly those probablitites are calculated using history as a huge factor. Only if you limit your perspective to the things that inflation is not affecting. It is certainly not increasing GDP on a quid pro quo, but you may want to reconsider it’s impact on the economy. It’s only inflation if it benefits the economy? Inflation only benefits those who control the money supply. For everyone else it is a transfer of wealth to the powerful and wealthy. Why aren’t asset bubbles a result of inflation? Judging what is good or bad is great for understanding one’s moral values, but it will never help to determine the probabilities of economic outcomes. >>>You are assuming incomes must inflate with consumer goods. Why? People and corporations borrow, (money/debt creation), and spend with no concurrent rise in wages. This is really where you and I disagree. I am of the belief that when you create debt, what you’re actually doing is decreasing your buying power in the future. Debt = Reduced future buying. Though Debt can be used to prop up assets, and even to manipulate energy, commodities and food, prices cannot stick if the debt is too high, and being massively manipulated by centralized planers. <–That's where we are right now. I read everything you wrote and we just disagree. I am of the belief that the only way to increase the price of assets, goods and services is by rising incomes and by debt. The problem is now that the debt has expanded to such a level that future debt is impenitent beyond asset bubbles, the debt cannot be expanded any more without major consequences. <–That's where the Fed is right now. This explanation jives with my understanding/beliefs. If you want to maximize your debt level today, you need to buy/finance your house first to get under the 43% DTI cap (or slightly higher for non-QMs), then buy/finance your cars (dealers will finance your well above the 43% back-end DTI), and finally, take on a ton of student loan debt (they’ll take you to many multiples of one hundred beyond your income). “The decline in mortgage balances from accelerated amortization and foreclosure write-offs has finally been overcome by increases in mortgage debt due to home purchase lending,” said Amy Crews Cutts, Equifax Chief Economist. “In February 2014, the total balance of home equity revolving loans is $485.3 billion, a decrease of 6.8% from same time a year ago and a five-year low. Similarly, the total number of loans outstanding in February is 10.3 million, the lowest total in 10 years,” the report said. Mortgage risk as measured by the American Enterprise Institute’s (AEI) International Center on Housing Risk fell slightly from January to February, though certain market segments continue to see a rise in potential problem loans. AEI’s National Mortgage Risk Index (NMRI), a measure of loans’ default risk under stressful conditions, retreated to 11.6 percent last month from January’s reading of 11.8 percent. To gauge where February’s index lies historically, 1990 vintage loans would have an estimated index value of 6 percent, while riskier 2007 loans would be up at 19 percent. Both of the component indices measuring risk ticked up, indicating an increase in default risk; the index gauging risk conditions at Fannie Mae and Freddie Mac inched up one-tenth of a percentage point to 5.9 percent, while the Federal Housing Administration’s (FHA) risk index moved up the same amount to 24.5 percent. An index value of less than 6 is “indicative of conditions conducive to a stable market,” AEI says. While both components were up, the overall composite still benefited from a decline in the share of high-risk loans last month and a slight improvement in the share of low-risk loans. Still, at 42.8 percent, low-risk lending remained down more than 4 percentage points compared to six months prior. Even with the overall decline, February’s index illustrates the lack of impact the qualified mortgage (QM) rule has had on lending, AEI says—due in part to selective enforcement of the 43 percent debt-to-income ratio (DTI) requirement. According to the group, about a quarter of home purchase loans tracked in the index that are classified as QM exceed that threshold. “Since all of the government agencies are exempt from that, we see a continuing rise in loans with debt ratios above 43 percent,” said Edward Pinto, resident fellow for AEI and co-director of the International Center on Housing Risk. At the local level, all states registered index values above the 6 percent line, with only Hawaii coming in below 7 percent. Most states have a composite index between 9.5 and 13 percent, AEI reports, though a few at the high end of the spectrum—such as Mississippi—remain in the mid-teens. “Most of this variation is really a result of whether a state has a high or a low concentration of FHA loans,” said Stephen Oliner, resident scholar for AEI and also co-director of the Center on Housing Risk. Oliner offers as an example California and Texas, the two states with the largest FHA markets and which each have risk indices above 10 percent. “It’s clear the FHA is not doing any active risk management with regards to the loans that they’re guaranteeing” in vulnerable states, he added. Monday’s release from AEI is timely as more lenders discuss their options to expand offerings and guidelines for borrowers with credit scores below 640—loans that, according to AEI scholars, have a greater than one in three chance of defaulting. Risk is headed much higher along with defaults simply because mortgage debt is still being incurred at interest rates >economic growth (currently 4.51% vs 1.2%) so homedebtors are NOT able to produce enough output or create enough new/real wealth to service compounding principle + interest. So if I loan you $100 at a 10% interest rate, are you saying it would bankrupt you? Sorry you feel that way. The point is your argument ignores the size of the debt, making it in effect, nugatory. You just hit the nail on the head, if unintentionally. When the Federal Reserve creates money/debt, it is impossible to create enough to pay the interest, thus the Fed will ALWAYS have to create more money/debt. It is the largest and ultimate Ponzi scheme, and like all Ponzi’s it will at some point collapse. Not necessarily. In theory, when the federal reserve creates money, it is balanced by the increase in value produced by the economy. As long as the money supply increases at the same rate as value is created, it is neither inflationary or deflationary. If the Fed creates $100, it does so by creating $100 of electronic money and then buys $100 worth of treasuries from the member banks, which were required to buy them from the Treasury. Even though $100 of bonds were created by the Treasury, there is actually $100 plus interest owed, plus the vig that goes to the member banks. So, with $100 created, there is more than $100 in debt created. Unless you can make $100 plus $5 equal $100, it is a Ponzi and it at some point it will fail. Technically, the buyer buys a $100 bond for $95 or whatever, but it does not matter in this context, because the Fed only creates enough to buy the debt, but not enough to pay the vig. There is nothing in the Fed’s charter to allow it, nor is a process in place to introduce the interest owed into the economy, except as more debt. You can try to kid yourself about some value added that somehow makes up the difference, but math is math and $100 plus $5 will never equal $100. A lender provides a loan to an entrepreneur for $100. This entrepreneur creates something worth $105 in value. He sells the item, repays the loan, and makes $5 in profit. Where does that $5 come from? Does the value of all goods and services in the society increase by $5, or does that $5 come from the other holders of currency in a zero sum game? The answer to the above question matters because if $5 is not added to the money supply to match the $5 in additional value created by the entrepreneur, then the economy will experience deflation because all other goods and services must be reduced in value by $5 to adjust for the $5 that went to the entrepreneur. If the money supply expands to match the total value of goods and services, there is neither deflation or inflation. If the money supply grows too fast, you have inflation, and if it grows too slow, you have deflation. Even on a gold standard, there are gold miners and producers adding to the total amount of gold. This approximated the increase in value of goods and services in pre-industrial economies. The creation of money by the federal reserve is not a Ponzi scheme. All Ponzi schemes implode because they depend on a future greater fool who may not fund the Ponzi scheme. How could the federal reserve Ponzi scheme implode? The federal reserve can always print more money to buy more bonds. They may create a lot of inflation, and they may devalue the currency, but they will never be insolvent, and they can sustain this forever. Maybe implode is not the correct word. But, it is a Ponzi because it does depend upon larger and larger increases in the money supply and it will fail when more and more people or entities withdraw from using the dollar. In a closed monetary system, such as a gold standard, (it costs to create/mine more gold), whatever is perceived as value added is included in the money supply. The money becomes more valuable, exactly the opposite of what our present monetary system manifests. If there is value added in a closed monetary system, it costs less to buy those items which have added value. Standard of living goes up, money does not. You two can pat each other on the back all you want. It does not change the fact that you are wrong. It just means that you are congratulating each other on denial and ignorance. Can you site where you saw that? I trust that you are right but I,ve just never seen it anywhere and it is huge, because IT DOES mean the Feds balance sheet is a bad bank. My understanding was that the Fed could only buy A encyclopedia MBS. If you are right, then the Fed will never wind down its balance sheet because no investor will ever buy this crap. The federal reserve website’s FAQ on MBS purchases states, ” Only fixed-rate agency MBS securities guaranteed by Fannie Mae, Freddie Mac and Ginnie Mae are eligible assets for purchase. These eligible assets include, but are not limited to, 30-year and 15-year securities of these issuers. Ineligible assets include CMOs, REMICs, Trust IOs/Trust POs and other mortgage derivatives or cash equivalents.” All HAMP loans are GSE guaranteed, so the federal reserve is certainly buying them. Or, rather, all the money that’s been created is sequestered from the actual economy and may as well not exist for most purposes. I forgot to put quotation marks in the post above. And what happens when the FED sells its MBS? Sure they will have to sell it at a discount, but bad debt is sold to debt collectors all the time. From a financial perspective, 20 cents on the dollar is a whole lot better than zero, which is what the FED would get when the sheeple discover that foreclosure is politically infeasible. The FED might just say that buying MBS was a temporary measure and that since we are turning a corner in the economy this is the right time to transfer the assets since the FED isn’t in the business of servicing loans long-term. They then let BofA or JPM or WF do the dirty work – with Fannie and Freddie profits used to finance it all. I don’t think the federal reserve will ever sell these loans. They will just keep them until maturity. Within 7 years, most will be gone anyway as people want to sell their homes. The federal reserve will grant a short sale just as quickly as they will grant a loan modification, so even if the people are underwater, they will be able to get out. Is there any available data on how many private mods are out there, their value, geographic concentration, reset schedules, etc? Although their data collection practices are questionable due to their pro-mortgage industry PR function, HopeNow probably has the most complete numbers. Also, this report has some of the geographic dispersion data and it shows that in the 4th quarter 61,000 out of 68,000 mods completed, or 90%, had a fixed rate term of 5 years or longer. So it seems that the vast majority of total mods are likely to eventually fail. Nice. I think that’s wishful thinking. The early mods failed at a high rate because the terms weren’t very generous and home prices were still declining. A lot of commentators base their assumptions about mod performance on those early numbers from 2008. The mods being granted from mid-2009 on were given much more generous terms — often times the payments were lower than comparable rents — and with home prices rising dramatically the borrower psychology has changed. From the borrower’s perspective, you may as well “rent” from the bank for cheaper than it would cost to rent if you lost the home. Also, the possibility of attaining equity affects behavior. Loans that have an LTV between 100-125% perform much better, and a lot of modifications are in this range thanks to the past 2 years of appreciation. Agreed. It was entirely predictable that as house prices rose to the point at which their mortgages were no longer underwater, those owners who previously could not pay their mortgage would magically find the means to keep their homes. Apparently bankers aren’t the only ones pissed off at the CFPB. The discord within their own ranks is reaching a fever pitch. In an ironic twist, it turns out that the CFPB’s own managers have shown distinctly different patterns in how they rate employees of different races, according to confidential agency data obtained by American Banker. Specifically, CFPB managers show a pattern of ranking white employees distinctly better than minorities in performance reviews used to grant raises and issue bonuses. Overall, whites were twice as likely in 2013 to receive the agency’s top grade than were African-American or Hispanic employees, the data shows. What’s more, those disparities are only one of many serious personnel problems plaguing the CFPB. Inside the agency, morale is poor and management has been accused in several cases of favoring Caucasian men and of creating a hostile work environment. That’s according to interviews with a dozen current and former staffers across six departments, all of whom requested anonymity over concerns about retaliation. Several employees expressed fears that management “retaliates” against employees who file complaints. Some say that after they voiced concerns, their performance ratings were lowered, preventing them from receiving raises or promotions. Others said human resources failed for months to respond to their formal complaints or referred them back to the managers involved. Is the Fed rolling these mortgage mods into MBS or not? And are the mods “principal reduction” or just lower rates and extended time on the loan? There is no way to know for sure, but many surmize that they have bought and are buying and are taking as collateral less than AAA paper, even though the Federal Reserve’s charter specifically states that it is to take only AAA paper as collateral. I think you can assume that the Fed is taking any paper that the banks need to get rid of.